Today is another special holiday post featuring some shine of course. So you may may realize now, that I kinda have a thing for sequins. Really? like what girl doesn't? 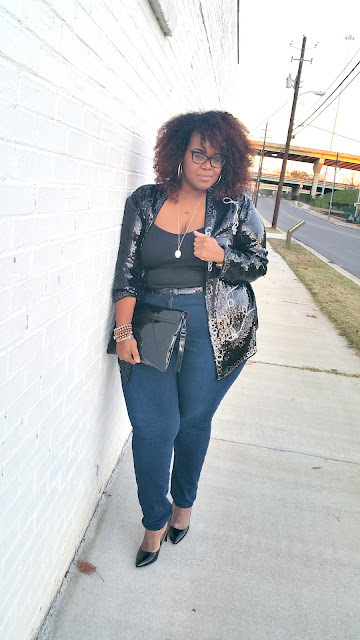 Plus today I'm collaborating with two of my favorite ladies, Georgette of Grown and Curvy Woman, Bianca of Curvaceouslybee and Jeniese of The Jenesaisquoi to share our sequin's love. 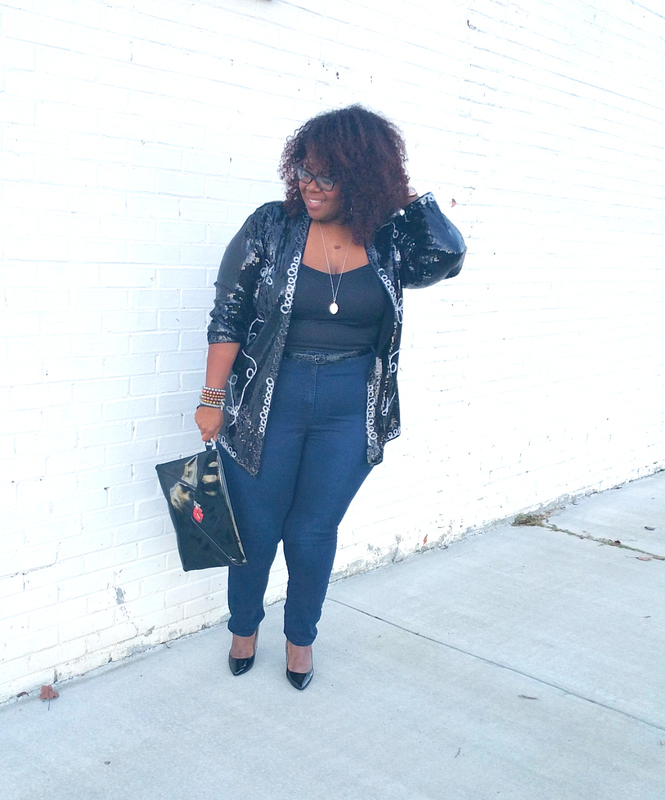 My sequins look is a little something special from my vintage closet. This eighties duster was a great find from a local thrift store, little to no visible damage and a great fit. 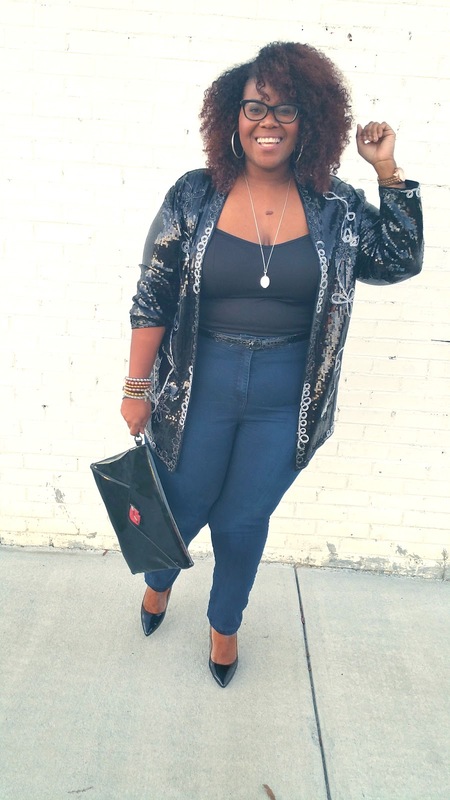 From the moment I saw it, I knew I was about channel my inner Donna Summer or Chaka Khan. Put me under the spotlight and let me work the room in this number filled with sparkle. 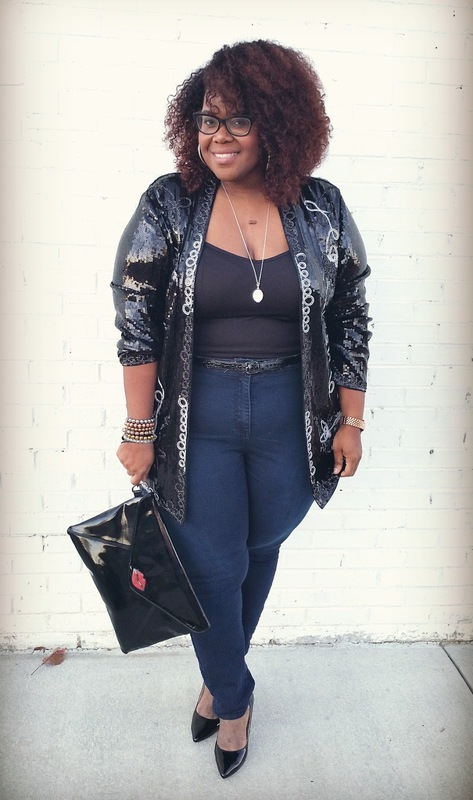 I paired it with my jeans from Your Clothing ( sold out)similar pair below, cami and patent pumps for more shine. And if you haven't noticed, I amped up the style with some new big hair. I'm wearing Sensationnel 100% Virgin Remi Bare & Natural Jerry Bohemian. I picked it up from the local beauty supply store. I love the hair, the look and texture mimics my hair fairly nicely unfortunately it has some shedding and a serious tangle issue, which can be a problem in my day to day life. But I shall continue in my search for the perfect hair. 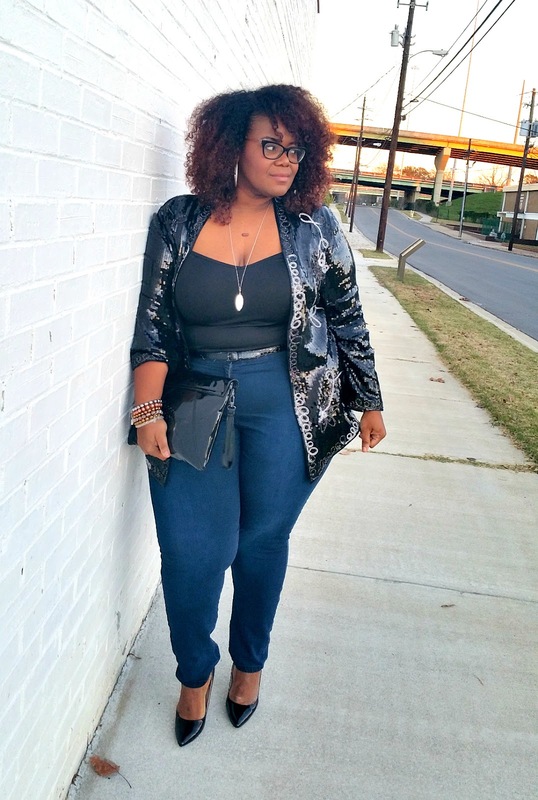 Don't forget to check out Grown and Curvy Woman, The Jenesaisquoi and Curvaceouslybee ! That duster is so me and that hair is amazing. I need that winter hair. The struggle has been real.